India made up for their poor performance in the last game by performing better in this one and winning the fifth ODI to take the series 4-1. Rohit Sharma won the toss and chose to bat as he wanted to test the batting line-up while setting up a score. India had made three changes after their loss in Hamilton whereas New Zealand just had the one forced change. The test didn’t start well as India lost four wickets inside the first powerplay. But some useful contributions from the middle-order batsmen helped India reach a total of 252. Chasing 253, New Zealand lost wickets at regular intervals as they were bowled out for 217 in 44.1 overs. There were times when it seemed like NZ would run away with the game but the Indian bowlers kept pulling it back. This win will give India a lot of confidence looking ahead at the World Cup because it was the middle-order who contributed heavily. India continued their great form in this format as they won another ODI series. On the other hand, New Zealand would be disappointed with the fact that they were completely outplayed in their own backyard. Here's a look at 4 reasons why India won the 5th ODI at Wellington. 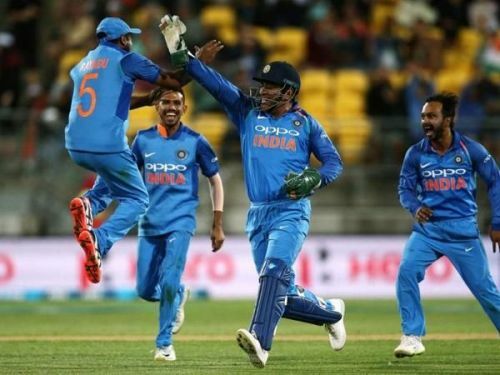 India’s top order once again struggled against the early swing from the New Zealand pacers as they were reduced to 18-4 inside the first ten overs. Boult and Henry had picked up two each and it seemed like it would be a similar story like the last game where India was bowled out for 92. But Ambati Rayudu and Vijay Shankar had different plans. They came together when India was in real trouble and slowly and steadily started building a partnership. Rayudu initially took a lot of time as he was just looking to survive whereas Shankar who was sent in ahead of Kedar Jadhav and Hardik Pandya rotated the strike really well. They built a 98-run partnership in 133 balls and took India’s score from 18-4 to 116-5. Shankar who was batting beautifully on 45 got run-out due to a huge miscommunication between him and Rayudu. Nonetheless, this rebuilding of the innings set up a great platform for the likes of Jadhav and Pandya to launch the innings.